"A life ain't a life 'til you live it." It feels too good to implode. Romanticizing self-destruction is nothing if not second nature to me and countless others living in a stew of their own depression and impulses. When I think of suicide in passing, which is often, there’s a banal air to the thought. It seems more a daily ritual to imagine drinking myself to death or driving into a tree than it does some drastic or finalistic cry for help. When people discuss suicide and suicidal thoughts, they often forget the growing passivity of it, the way these thoughts flash by in a list of other equally benign things like remembering the dishes and to feed the parrot. Suicide is a permanent part of my life in a way that’s very thick and difficult to communicate. I’ve long since gotten over feeling sorry for the hours eaten up in a day to thoughts of my own death. Certain things are just true, and acceptance is more important than being bitter. Now, I’m far more interested in the “Why?” of the situation. Why, of all places, does my mind amble towards suicide? As it turns out, I’m not the only one going through the motions with a grand death on their to-do list. 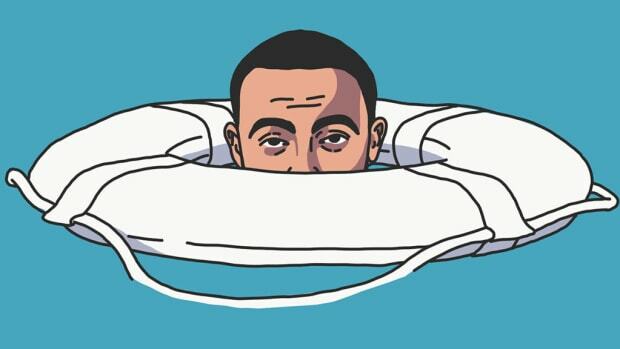 On Mac Miller’s fifth LP Swimming, he’s also prodding at his penchant for self-destruction, be it the slum of depression or the spiral of addiction. 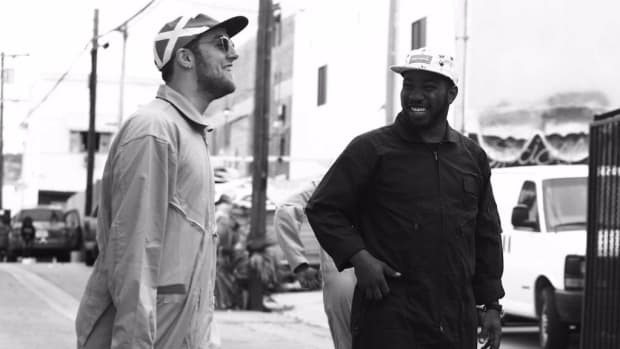 Rapping "But it feels so good right now” on “Ladders,” Miller dedicates the track to the siren-like quality of being your own worst enemy. There’s a thrill to this cacophonous downward tumble, just as there are consequences. 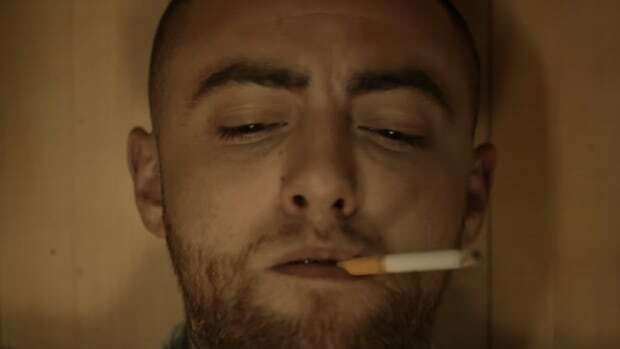 Mac knows it; I know it. But I live for this thrill just like I live out each day hoping to feel better. Passive thoughts of suicide are as common to me as the romanticization of my recovery: writer retreats and kitschy vacations and hours spent reading in some cafe in Paris. The underlying desire here is not to die, but to feel something. This is Swimming in an esoteric sense: the act of constantly stopping yourself from sinking. At the least, you can always feel the water splashing up on your face. Listening through Swimming and conducting a quick self-audit, the answer to the “Why?” of self-destruction becomes fairly obvious: the grandiosity and theatrics of it all make me feel alive. Sometimes, operating at an 11 is the only way to experience life at a five. The trouble comes when we realize that depression and apathy continuously erode the senses. My notion of “an 11” compounds, and suddenly the only way I can feel alive is if I’m grappling with my proposed death at every second. The only way I can feel alive is if I am constantly in the undertow. But as anyone could tell you, that’s no way to live. When every day is a series of tiny battles, the definition of living changes. The want for better is replaced by the want for nothing. 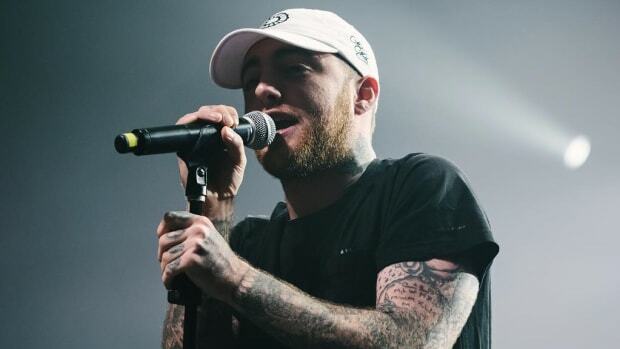 This is why “Wings” boasts such a despondent timbre as Mac Miller declares, “I ain’t feeling broken no more,” and we’re inclined to believe him because he sounds too resigned to lie, too sober to his situation to misunderstand it. “Wings” evolves into a tender, physic, and nearly uplifting tune, following the pattern of a typical conversation wherein I tell someone curious that I really do think about killing myself every single day and they express concern, and I express nothing. 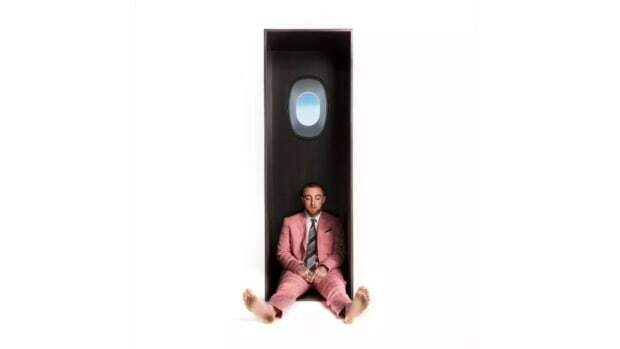 On “Wings,” Mac resolves that how he hurts is also how he flies. That’s a thin line to straddle, and an even harder temptation to ignore. So we don’t ignore it. There’s a unique discipline that comes with giving in to a certain point, to becoming the master of your own precipice. On Swimming, Mac becomes the master of his own much like I can abstain from cracking open a bottle of pills regardless of the number of times I spilled them out on my comforter and done the math. Somewhere along the way, I realize what I’m doing and the manic energy becomes lead on my shoulders—but now I can feel my shoulders. 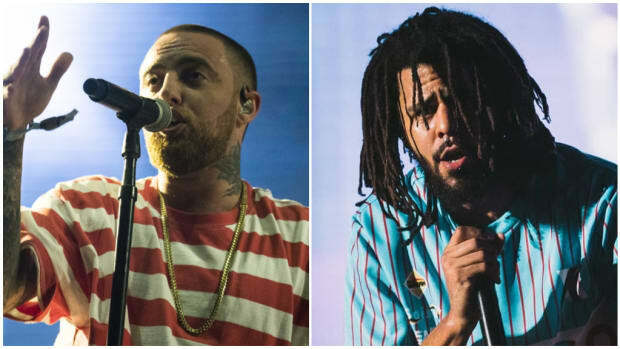 Similarly, one of the album’s more spirited vocal performances (“Self Care”) comes when Mac willingly drifts off into oblivion. 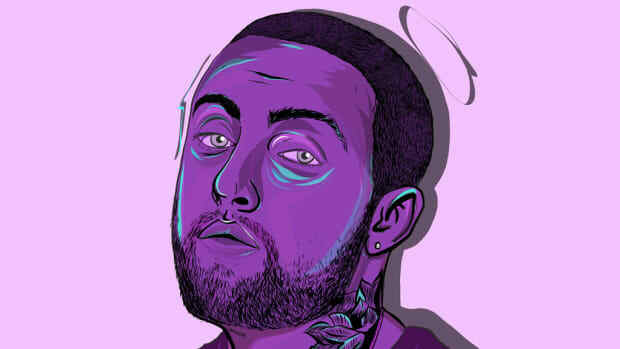 That is, when Mac Miller dies, he is at his most spry. Lost in the void of non-feeling, Miller may very well be more alive than ever. At the least, he will be at his most weightless. At the least, he sounds impassioned. The subversive message of “Self Care” is why daily ruminations on my suicide and all the macabre scenes I can dream up are not tangible cause for alarm. They are a reminder—sometimes the only one—that my heart, creativity, and passion endure in at least one form. Self-destruction is so intoxicating because every day with depression is a funeral for intense emotion. Depression is synonymous with being enrapt in a thick fog, knowing very well that life is beautiful, but struggling to see and breathe and believe that to be true. I am not frustrated to the point of suicidal thoughts, but I have suicidal thoughts to outdo my frustrations. 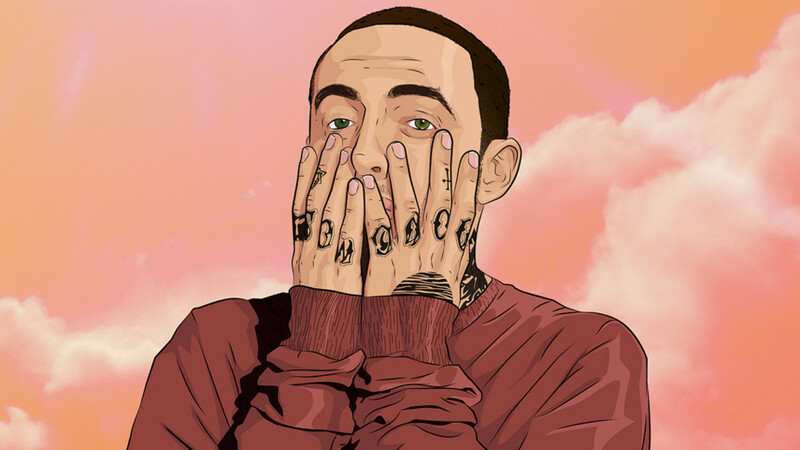 Swimming is a series of calculated and gorgeous-sounding ego deaths, tiny ideations that leave Mac Miller isolated in either deep ocean or deep space (“Jet Fuel”). The album is not scared of itself, and as a result, it’s the most classically beautiful body of work Miller has released to date. That’s not to say that self-destruction is beautiful, or glorious, or anything close. Just that it can certainly feel that way when I’m looking at myself in the mirrored medicine cabinet and realize that right then, I could kill myself without issue. The ease of the thought is the thrill, but at that moment I am also at my most alive, my most aware of my own humanity. That’s why self-destruction feels so good: while you’re on the high of feeling alive, you remember that there’s an actual life to be lived. 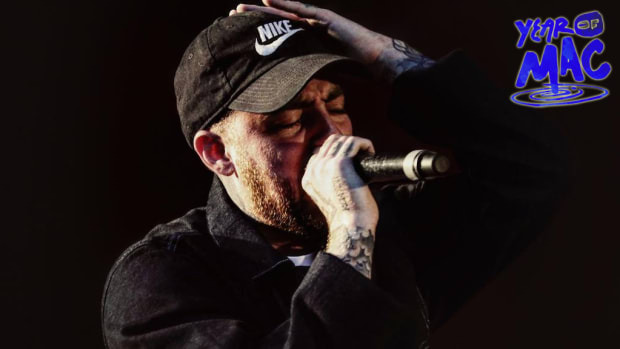 “You got the world in the palm of your hands, you still might drop it,” Mac raps on album closer “So It Goes.” That’s true, but just because we drop something does not mean we can’t pick up and keep it close. In truth, it feels good to destroy because it feels better to create—one begets the other. It’s difficult to lust after life if you don’t know what you’re missing, but constant thoughts of suicide are a potent reminder.